Do you remember 1968? If you do, you no doubt remember this tumultuous time with student riots, the hippie culture and free love. I’ve been reading an article about the history of Europe which reflects on the student riots in Paris. The Leftist manifesto was very much formed during this time. Though the Left was not organised enough to take control in France in the 60’s, the Leftist agenda slowly seeped into government policy and practice. Today, much of what we take for granted as our culture was radically introduced in the 60’s: equality of the working class; social welfare benefits for all; liberal social policies bringing choice and equality for women and minorities. The Sermon on the Mount gives Christians a manifesto, looking particularly at Matthew 5:13-20. The Sermon on the Mount is a manifesto for the Kingdom of God. Jesus gathers the disciples to him on the mountain and sits down and begins to teach them. Jesus sets out in the Sermon on the Mount a new programme of living and being which is to shape all disciples. 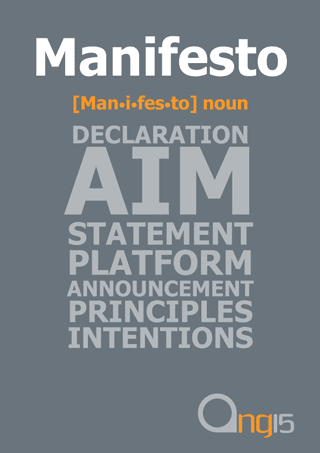 It is in every way an ideal manifesto which no one can achieve, but to which we are all called to strive for. Its unachievable demand is meant to be a constant call on our life to go further and higher and deeper so that the kingdom will be manifest in our life and actions. We do not despair because we have not or cannot attain it. By its very demand we recognise our need for God’s grace. By the impossibility of achieving it in our own strength, we look to Christ to consummate the Kingdom of God that he inaugurated by his life, death and resurrection. I want us to look briefly at two aspects of this manifesto for the Kingdom of God. First, the Kingdom calls us to a new way of being a disciple; and secondly, the Kingdom calls us to new righteousness. The first aspect to the Kingdom manifesto is a new way of being a disciple. Disciples are essentially followers and learners. As disciples of Christ we seek to follow him and to learn from him. But the manifesto of the Kingdom places greater emphasis on our discipleship and its impact. It puts more emphasis on being active, not passive disciples: You are the salt of the earth; you are the light of the world. As salt and light, we bear constant witness in who we are and in what we do so that others can see the Kingdom of God manifested in us, just as the world saw it in Jesus Christ: In the same way, let your light shine before others, so that they may see your good works and give glory to your Father in heaven. Most of us, as we live our daily life, compartmentalise our lives. We are employees; we are family members; we are friends; we are at work; we are at play. The discipleship we are called to is to be apart of all our life so that whether at work or play; whether in the grocery store or in church, we are to be salt and light, pointing to the kingdom in the way we are and in the way we act. A second aspect to the manifesto of the KofG is being called to a new righteousness. Listen again to what Jesus said: For I tell you, unless your righteousness exceeds that of the scribes and Pharisees, you will never enter the kingdom of heaven. Now this does not phase us too much, because we have come to associate scribes and Pharisees with hypocrisy and the like. But for a first century Jew in Palestine, Jesus’ words were radical. Let me offer a paraphrase for our times. Jesus is saying to you and me today that our righteousness must exceed that of the Pope and the Archbishop; it must exceed that of Mother Theresa and St Alban. Most of us think, that’s impossible, why try. But that is the point of the Kingdom manifesto, to urge us on to be more than we think we are capable of being. In Christ, we not only become all we can be, we become more than we think possible. It is a case of letting God work in us and through us so that his righteousness is manifest, not our own feeble efforts. When we read the Sermon on the Mount we are reading a manifesto for the KofG. It calls us to a new way of being and living in the world. It calls us to a radical cultural ethos; it calls us to a new way of being a disciple; and it calls us to a new kind of righteousness. The standard it calls us to is high, even unachievable in human terms. But that is point, we recognise our need for God’s grace and strength, we recognise that it is Jesus who brings in the kingdom by his life, death and resurrection and by working in and through our lives as children of the Kingdom. Let your light shine before others, so that they may see the kingdom of God and give glory to your Father in heaven.